Evan Calder Williams. Combined and Uneven Apocalypse. Zero Books, 2011. 264pp. 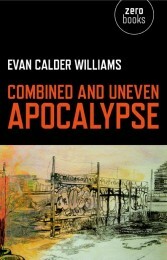 Evan Calder Williams’ Combined and Uneven Apocalypse tracks apocalyptic visions of the future back to their occluded origins, which for Williams is to say, back to the present moment. In different contexts, Teresa Heffernan and Slavoj Žižek have similarly asked: what if the apocalypse has already taken place, and we missed it? (Heffernan 6; Žižek 150-151). Williams’ book takes this provocation seriously, theorizing and critiquing the pervasive “apocalyptic fantasies of late capitalism…in the cinema and the wider cultural, political, and economic landscape from the end of the ‘60s to now” (1). is the possibility of grasping how the global economic order and its social relations depend upon the production and exploitation of the undifferentiated, of those things which cannot be included in the realm of the openly visible without rupturing the very oppositions that make the whole enterprise move forward (8). Given this reading of catastrophe and capitalist apocalypse, crisis is left aside as work for other analyses. The focus of this book is, on one hand, to theoretically analyze the symptomatics of apocalyptic thinking as they surface in contemporary film and, on the other, to urge contemporary thought and action to respond and take responsibility for the apocalyptic presence in our everyday lives. To put the punk into salvage is to occupy it too well, not to stand outside the logic of the game, but to track it to its far horizons. There we see the frayed hems of a mode of thought…. [Punk] had to do with the intersection of a close attachment to its historical present with the fact that it no longer believed in a future – the present is already the hollowed-out promise of that future (32). With a similar understanding of political time, salvagepunk recognizes the apocalyptic nature of the present, and instead of grasping a wholeness or unity, it takes up the leftovers of the capitalist mode of production that do not fit neatly into the system of which they are a part. Principle among Williams’ examples in this vein are Richard Lester’s 1969 film The Bed Sitting Room and the Mad Max films (George Miller 1979, 1981, and with George Ogilvie 1985). Chapter 2, “Plague in the Gears,” provides a loose cultural history of zombies and zombie films. Beyond clearing up misconceptions, including the fact that fast zombies were actually an innovation of Dan O’Brannon not Daniel Boyle, Williams reads a host of zombie movies—for example, George A. Romero’s Night of the Living Dead, John Carpenter’s They Live, O’Bannon’s Return of the Living Dead, and Boyle’s 28 Days Later—tracking the historical development of what he calls the nightmare image of the day (72). He deploys ‘nightmare image’ in a twofold sense: first, zombies are a “reigning cultural bad dream” (72); and, second, they represent “an eternal present of the world not coming to an end” (72). Part of the work behind this cultural history of zombie movies involves dispelling surface readings and misconceptions common to thinkers and fans of the genre. Williams takes issue with academic and intellectual readings of zombie movies that just scratch the surface: “Simply because a film seems to point out problems of social inequality does not mean that it is a radical film, or even one that is therefore ‘smarter’ and more aware than those films hell-bent on entertainment, social critique be damned” (79). In other words, for Williams there remains something to be desired in readings that take the movie’s setting, a mall for instance, to stand as a critique, of say, consumerism. Williams reads such interpretations themselves as reified thought, suggesting that lacking a theory of aesthetic or cognitive realism sufficient to the condition of late capitalist culture, “zombie films better capture the logic of the times, that opaque ‘almost-thought’ which always escapes the closure of facile critique” (86). But the critical importance of zombie movies should not be over-read. For Williams, it isn’t that zombies no longer mean what they used to; rather, “they no longer mean what they could” (143). He identifies the problem, in the larger framework of apocalyptic literature, as a cultural blindness. These films seem to be unable to think beyond the individual, the family, or the lovers, beyond the smallest and least collective portions of human life and culture. But, Williams refuses to give up or give in to these objects. He still sees in them “apocalyptic potential” (156). The final section, “Combined and Uneven Apocalypse,” operates doubly as a theoretical culmination and working through of the first two chapters on salvagepunk and zombies, and as a projection for and a program of action. With the term “apocalyptic potential,” Williams hopes for something that is not tied to forms of catastrophe or crisis and for a space generated by apocalyptic thought that has some level of autonomy (although I doubt he would use that word). Following the denotation of the word apocalypse, Williams calls for a “permanent visibility of the hidden” (156). By carrying on with his analysis through films and books, Williams reveals the nearest approximation of the structures undergirding capitalism’s totality: combined and uneven development (157). He considers such a view post-apocalyptic and reorients the implication of the ‘post’ from a temporal to a political axis. For Williams, a post-apocalyptic view is “a necessary optic onto the flourishing wastelands of late capitalism, the recognition that the apocalyptic event has been unfolding” (my emphasis; 158). At the heart of his project lies a commitment to the way things could be. If we are already apocalyptic, Williams’ book suggests that we begin the work of uncovering the image of the nascent post-apocalyptic subject. An exposure to an object threatens to become, according to Adorno in “Culture and Society”, a “cultural criticism [that] shares the blindness of its object.” (27) There is a feeling that Williams’ book may at times be victim to this familiar critical tendency. I believe this closeness to the object, which at times risks becoming a problem in the text, also enables some of the more compelling aspects of the book. Of course this book, like the genre of narratives it engages, repeatedly spells out certain doom and a lack of future; but Williams shows that this need not determine how we read apocalyptic narratives. Combined and Uneven Apocalypse is not the mind trap that it could be, considering the pervasive tendency of contemporary apocalyptic narratives to foreclose revolutionary thought rather than generate it. One element of the book I find immensely useful is the work Williams does in categorizing apocalyptic narratives in light of the different types of (capitalist) crisis covered earlier. For instance, his detailed taxonomy of eco-apocalypse narratives offers a valuable contribution to the very active scholarship on this sub-genre today. Williams’ description of O’Brannon’s 1985 film Return of the Living Dead features more than just fast zombies. It actualizes the cultural references and pastiche so common to postmodernism, entrenching both the aesthetic tenets of the zombie film and the deep symptoms of late capital. Adorno, Theodor W. “Cultural Criticism and Society.” Prisms. New York: Columbia University Press, 1967. 19-34. Print. Heffernan, Teresa. Post Apocalyptic Culture. Toronto: University of Toronto Press, 2008. Print. Žižek, Slavoj. First as Tragedy, Then as Farce. London: Verso, 2009. Print. Brent Bellamy is a PhD Student at the University of Alberta, Canada. His work focuses on the intersection of post-apocalyptic narratives and late capitalism. He is currently teaching a course on the 1980s and apocalyptic fiction. His article on the durability of the metaphor of the road in American song recently appeared in a special issue of the Canadian Review of American Studies.